Our Lady of Perpetual Downforce: Naked! 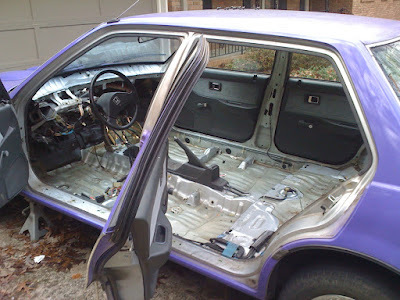 We almost finished stripping out the interior and engine compartment last night. Out came the seats, dash, carpet and side panels. I found a petrified french fry, numerous pens and 26 cents. What remains is the door trim and headliner. 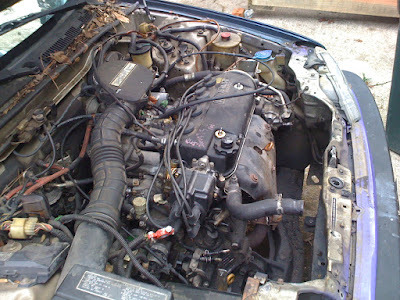 Under the hood we took out the AC system and changed the ATF and engine oil. Weight is one benefit of removing the AC, but we really just wanted to clear out some space in an otherwise cramped engine compartment by yanking out anything unnecessary. We also short circuited the heater core so we could take it out with the dash. We still need to get the radiator back in and track down the coolant leak. We may get lucky in that the leak is probably in the heater valve that we just short circuited!